North Carolina is home to 13 snakes species that live near the water. Two of these species are dangerously venomous to humans, but the remainder are essentially harmless. Collectively, they eat a variety of small aquatic creatures and are hunted by predators such as herons and raccoons -- all serve important functions in local ecosystems. The coastal plain is home to the majority of these species, though the piedmont is home to a few as well. Four different water snakes, all members of the genus Nerodia, inhabit North Carolina. Midland water snakes (Nerodia sipedon pleuralis) are primarily denizens of the piedmont, though they cross the fall line in places. 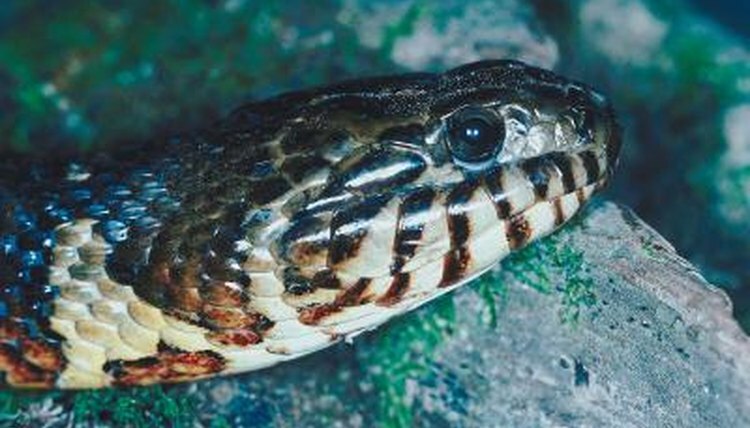 They occasionally interbreed with banded water snakes (Nerodia fasciata), who live in swamps, ponds and rivers of the coastal plain; both species are highly opportunistic predators of fish, frogs and snakes. Brown water snakes (Nerodia taxispilota) inhabit large rivers, where they primarily feed on catfish. Red-bellied water snakes (Nerodia erythrogaster erythrogaster) live in a variety of aquatic habitats, particularly swamps and wetlands, where they hunt amphibians. Queen (Regina septemvittata) and glossy crayfish snakes (Regina rigida) are close relatives that inhabit two different parts of North Carolina -- queen snakes inhabit the piedmont, while glossy crayfish snakes live throughout the coastal plain. While both species prey on crayfish, the queen snake only consumes freshly molted, soft-bodied crayfish. Black swamp snakes (Seminatrix pygaea) are about a foot long and inhabit the aquatic vegetation of ponds, streams and swamps. Because they are smaller than most other aquatic species, and less capable of overland movements, swamp snakes aestivate in the mud during droughts. While not as aquatic as water snakes, eastern garter snakes (Thamnophis sirtalis) frequently prowl the areas around ponds and streams, where they hunt frogs, salamanders, worms and fish. Garter snakes swim very well, and will often enter the water to escape predators. Ribbon snakes (Thamnophis sauritus) are close relatives of garter snakes, and similar to them in terms of both appearance and their adoption of a semi-aquatic lifestyle. Ribbon snakes are exceptionally long, lithe snakes that reach similar lengths as garter snakes, but lack their bulk. Mud (Farancia abacura) and rainbow snakes (Farancia erytrogramma) are closely related creatures that inhabit aquatic habitats throughout the coastal plain. Both snakes are black dorsally; mud snakes have red bands on their sides, while rainbow snakes have red lengthwise stripes. Both species are somewhat large -- reaching about 4 feet -- and hunt similar elongate, ectothermic prey. Mud snakes specialize on amphibians, such as sirens (Siren sp.) and amphiumas (Amphiuma sp. ), while rainbow snakes subsist almost exclusively on freshwater eels. Though they are more common in upland forests, copperheads (Agkistrodon contortrix) sometimes inhabit wetlands and riparian areas. By contrast, cottonmouths (Agkistrodon piscivorus) rarely travel far from water and are specifically adapted for their semi-aquatic lifestyle. Both have powerful venom used to catch prey and defend themselves from predators; however, neither are likely to bite humans unless handled or stepped on. Both species are generalist predators, however copperheads prey heavily on insects, lizards and rodents, while cottonmouths consume more fish and snakes -- both species eagerly eat frogs. What Are Native Snakes in Georgia With Orange Bellies? What Is a Non Venomous Snake That Looks Like a Cottonmouth?